Are you getting bored of the play dough posts yet? This will be the last I promise. The kids are having too much fun with this stuff though, and happily the batch that I made originally for the play dough train table is still totally fine and not dried out in the slightest. 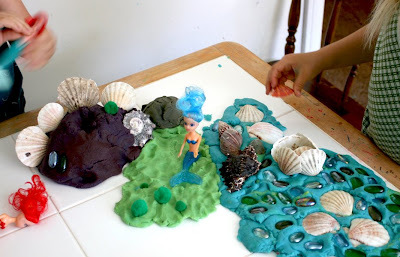 We read "Dora saves mermaid kingdom" this morning and so the play dough obsessed kids wanted to make mermaid kingdom. It didn't take much really, and that's why I wanted to make a post about it, that and the fact that it's likely to appeal to any girls that might not be into dinosaur island or train tables. There was no ridiculous underlying structure like with dinosaur island, and no prerequisit of train tracks like with the train table we did. The key components were the home made play dough and three items from the Dollar Store. 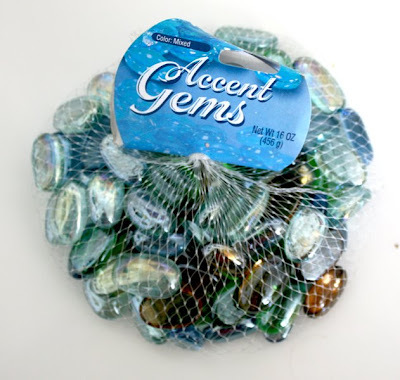 Glass nuggets, a basket of sea shells and a packet containing two mermaid dolls. Total $3 and then whatever other random stuff I found around the house for them to stick in it. 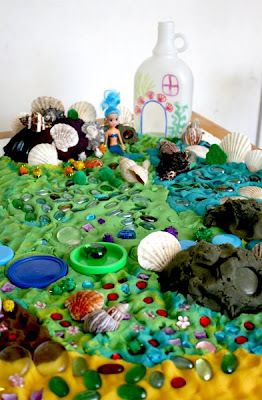 You could do this quite happily with just some blue play dough and make a small version in a baking tray. 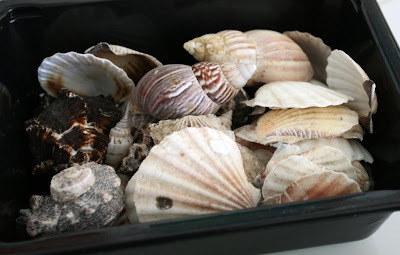 I was amazed at how many big sea shells were in the basket for one dollar! 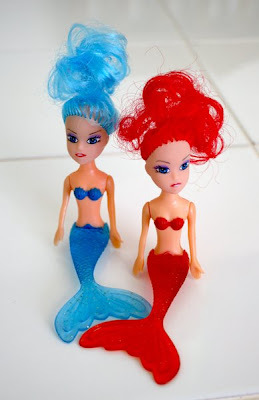 We dug out a couple of "baby mermaids" that we got a long time ago back in the UK. One poor baby's arm was amputated! Not sure when that happened! 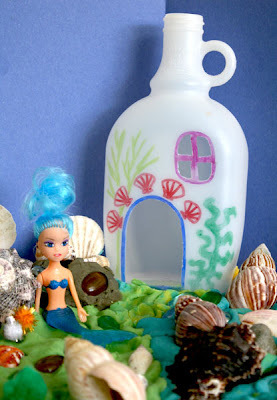 I made them a few pipe cleaner sea weed bits and then pulled out a couple of plastic bottles that I'd been saving to make fairy houses (we can still re-use them in the future). I just cut out doors and windows with an Exacto knife and drew on them with Sharpies and the kids put some doll's house furniture in there. Plastic bottle tops made for a nice path to the houses. 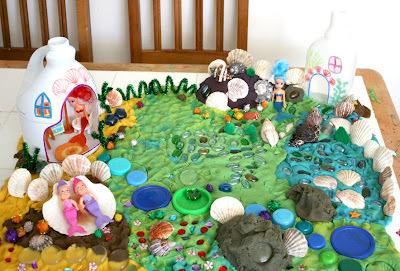 All of this stuff comes right out of the play dough easily and can be used again for other play stuff or to go in the recycling. 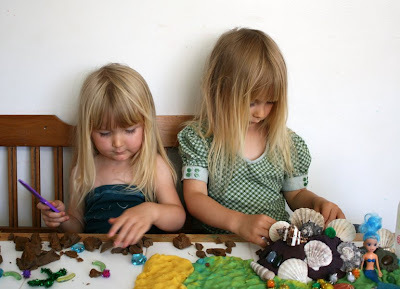 Other bits we stuck on were some glittery craft pom pom things that were supposed to be sea urchins and some kiddie craft jewels we had handy to make mermaid kingdom full of treasure. I love how involved the kids get with this sort of thing. My three year old went off to get her dress up mermaid tail to wear while we were making it. If you've got Sponge Bob mad children then you could always have a go at recreating Bikini Bottom ;) If our printer had ink in it then I would have printed some of the smaller fish I drew a while back for the girls to colour and add into the mermaid kingdom taped to cocktail sticks. As we've done in the past, we'll just keep it out for the rest of the day and pack it away in the evening. I'm intrigued to see how much mileage we will get out of this same batch of playdough. It's doing pretty well so far! I have linked your blog so many times in the last week on my blog as everything I am doing with my kids for the winter holidays (I am in Australia) has been an idea from your blog!! WOW !!! That´s amazing!!! Lovely! Really great work. I can´t find cream of tartar :( I been here in Prague in the farmacy and she looked me what I want. So I will tell to my husband to ask in Italy. Becouse we want to try your homemade playdought as sonn as possible. Thank you for great inspiration!!! WOW! Wow, wow, wow! I would have gone crazy for this as a kid. I wish I have a time machine tutorial. This is one of the coolest activities I have ever seen! I'll be linking. And pining. Rachel, if you liked this one then brace yourself for the fairy post that's coming up this evening. My two have been utterly absorbed in it for hours and it's gone way beyond what I had planned. Thanks for putting our crafts on your blog. It's nice to see the new faces coming through and saying hi. Oh holy cow that is FANTASTIC! 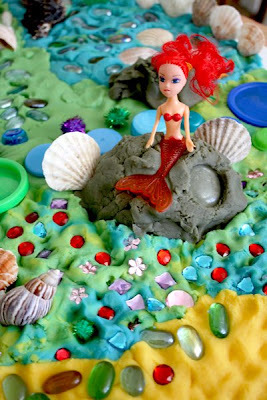 My two preschool-aged mermaid-daughters will FLIP over this project! I love the things you create with your children. Very inspiring, thank you! With play dough I've found that the more you use it the longer it lasts. If it sat in a container somewhere it would get yucky. So bring on the play dough fun! Your ideas are so inspiring. We found the mermaids today. 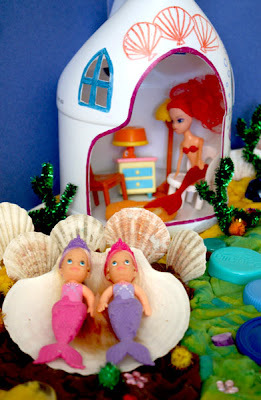 The girls are so busy with the seashells and houses. Thank you soo much. Always impressed by your talent!!! so fun! We've been making a village for our little friends too! I love the bottle idea. I carved out some bird houses for ours. I bet your girls had a blast! This is adorable!! Great ideas. Mistake! 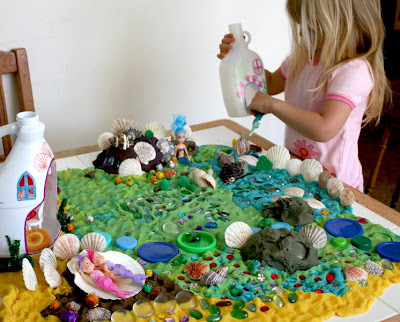 Just let my girls see this post (and the other ones) and they're asking, "can we make a fairy kingdom?" "Can we make pink paper?" Can we make mermaids?" Pressure. 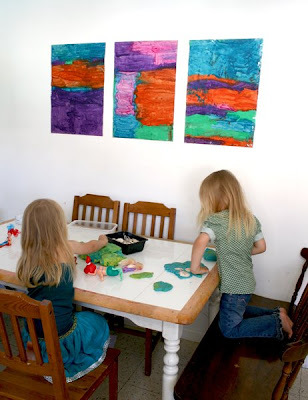 I think that you guys have the most awesome fun doing crafts and arts...I love your blog! I was just popping over from The Crafty Crow. 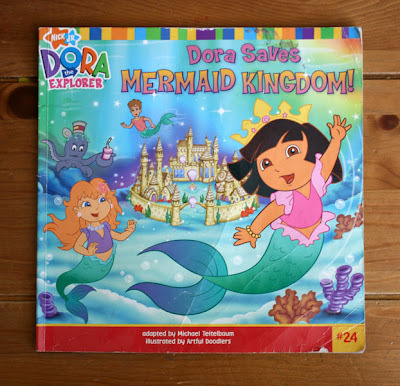 My daughters LOVE "Dora Saves the Mermaids." 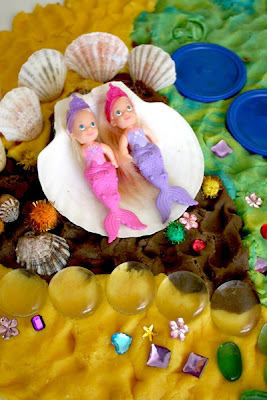 The twins love it so much, I made them a Mermaid Dora cake for their birthday (which you are welcome to see here if you want: http://tranafamily.blogspot.com/2009/01/happy-birthday-lily-leah-part-v.html ). Such great ideas! I will definitely be bookmarking them. Thank you! That is Magnificent!! you inspired us today :) we were not so ambitious but we still had fun. I did my best to link back to you. I hope it worked! Have just found your website - absolutely amazing! Love those fairy houses and will get snipping tomorrow! How wonderful to be able to create something so pretty and magical out of a plastic carton. Truly inspirational! Thank you!! Wow this is a cute idea. 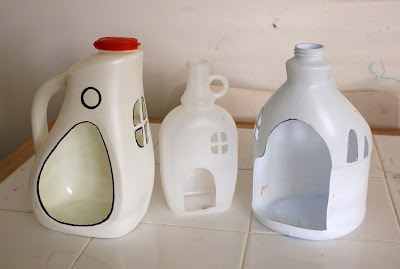 I know my grandkids would just have a blast...and granny too :o) I love the bottle idea...inspires some ideas for me.